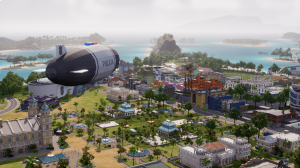 One of the new features introduced in Tropico 6 are Raids. There are four unique raid buildings in the game that will allow you to make raids. They are Pirate Cove, Commando Garrison, Spy Academy and Cyber Operations Center. Sending your operatives out on raids will result in various different outcomes, these include getting additional resources, technologies, manipulating trading prices, changing diplomacy ratings and preventing the various superpowers from sabotaging your archipelago. • Writing fake reviews for tourism This Raids guide will explain the different types of raids each raid building has. The first and most basic Raid building in Tropico 6 is Pirate cove. This is a relatively inexpensive construction and doesn't have any schematics that need to be unlocked. The only requirement with Pirate Cove is that it must be placed on a shore. This Raid Building specialises in plundering. The second Raid Building in Tropico 6 is Commando Garrison which specialises in military actions both in Tropico and outside the island. This Raid Building allows you to send commandos on raids to decrease Caribbean happiness, fight guerillas, sabotage superpowers, or go on a heist to steal a famous landmark. Spy Academy is an Espionage Building that allows you to train spies and launch Espionage operations against Superpowers, or other players. The effectiveness of the Spy Academy equals the number of spies that can be trained. The highest number of spies it can train, with a very high effectiveness is 16.
is the last Raid Building you will unlock in Tropico 6. Its purpose is disinformation campaigns, meddling in other countries’ domestic affairs and manipulating financial markets. Check out our World Wonders Guide to learn more about the for famous landmarks you can steal.